Sitting 73 feet above the pavement, the Gasson clock tower is reached via elevator to Gasson's third floor and then through a locked and unmarked door and then by ascending a wood ladder and a four-story spiral staircase just wide enough to admit one person at a time. 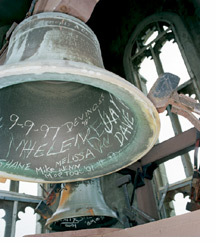 An alarm and surveillance system protects the tower and its valuable bells. "It's a little spooky," notes electrical technician Leo Croft, BC's unofficial guide to Gasson's tower, as he climbs in the gloom and dust behind a recent visitor. Once, the works that ran the clock and bells required twice-weekly handwinding of a weighted chain that reached down to the basement of the building; but since the clock and bells were put on automatic controls in the 1960s, most visitors have come for the view and to leave their names in chalk. On this clear summer day, the tower is sun-filled, with views of the Blue Hills to the southwest, and of suburban towns ranging out past Needham, looking like toy villages. Of the four brass bells, the largestinscribed Ego Sum Ignatiu, or "I am Ignatius"weighs half a ton and peals the do note (F) when struck by a 24-pound hammer. The other three bells are named for Jesuit saints Francis Xavier (fa-B flat), Aloysius Gonzaga (sol-C), and John Berchmans (la-D). All four sit in a wood frame that has room to hold six or seven more bells, a specification ordered up by BC President Thomas Gasson, SJ (1907-14), who authorized the tower and who seems to have been ambitious about the campus's capacity for chimes. But his budget allowed for four bells, and that has sufficed ever since for marking roughly 400,000 hours (out of regard for residential neighbors, the bells don't chime during the night), and a proportionate number of half hours, quarter hours, and Angeluses at noon and 6:00 p.m. When Joseph Burns '67, an associate dean of arts and sciences, makes the climb up the stairs with students from his seminar on BC history, he tries to impress upon them the significance of a Catholic bell tower overlooking Brahmin Boston in 1913. "The tower was a proud statement that Catholics and Jesuits had 'made it' in Boston," he says. The original and ambitious plan for Gasson Hall never foresaw the building in its present setting. 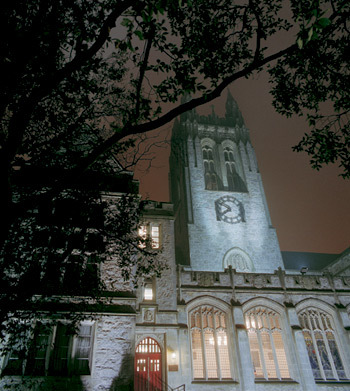 Submitted by the architectural firm of Maginnis & Walshand chosen in a design competitionthe winning vision placed Gasson in a set of 19 companion buildings, all in the English Collegiate Gothic style and forming a cathedral-like shape, with the central "Recitation Building" (Gasson Hall) standing where the avenues representing nave and transept were supposed to have met. Gasson remained the only classroom building in Chestnut Hill until 1924, when Devlin Hall was completed, and it therefore became a microcosm of the University itself, housing everything from a basement locker room to reception parlors, along with chemistry and biology laboratories, an assembly room, and a cafeteria where, according to legend, students ate not at tables but standing at countersa design said to be dictated by the Jesuits so their charges could not waste time dawdling over food or poker. The means to build Gasson Hall did not come easy. Irish Boston was a relatively poor community, and construction came to a dead halt midway through the four-year process when money ran out. It did not pick up again until President Gasson received permission from authorities in Rome to sell the old BC athletics field, on Massachusetts Avenue, in Boston, and put the proceeds into Chestnut Hill. In the end, BC mounted parades, sold commemorative bricks, brought its alumni to shakedown dinners, and redirected funds that had been raised for a campus-based "Irish Hall of Fame." And BC held garden parties. The first of these took place on June 20, 1908, a year after BC bought the Lawrence Farm property. Societies affiliated with Boston College staffed booths on the site of Gasson Hall. The Boston College Club, the Loyola Guild, the Young Ladies' Sodality, and a set of Church-affiliated temperance societies drew about 25,000 people "to the country," including "well-known ladies" and "prominent laymen"according to the Boston Pilot. Archbishop William O'Connell '81 gave an address, a merry-go-round whirled, and the Algonquin Gymnastic Club performed in a tent. In the evening, the grounds were illuminated by 600 colored incandescent lights and more than 500 Japanese lanterns, while girls in "Dutch costumes" sold candles and unspecified souvenirs. At 9:30 p.m., fireworks were set off. "It was like a scene from fairyland," said the Pilot. An eye-straining puzzler to generations of Gasson 100 patrons, the stone medallion above the room's central door seems to depict two wolves mesmerized by a tall pot. 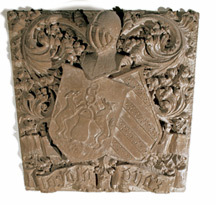 The image is, in fact, the seal of Ignatius Loyola's family, which protected its estate (legend says) by placing a container of food scraps outside the gate so that wild beasts would halt there and go no farther. 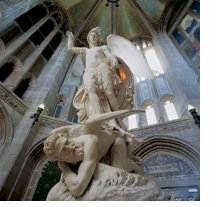 Considered by many the most arresting piece of art on the campus, the statue of St. Michael triumphing over Satan was, sad to say, not designed with the Gasson Hall rotunda in mind. Rather, it was commissioned in 1865 by Gardner Brewer, a Boston merchant who exhibited art at his Beacon Street home and who may not even have known of Boston Collegefounded two years earlier and lodged in the urban ghetto in Boston's South End. Adam de Chevalier Scipio Tadolinia well- regarded Roman sculptor of the timespent nearly four years planning and executing the project in Carrara marble, at a cost to Brewer of $20,000. Brewer died in 1874, and his estate sold the piece to a Boston gallery. Eventually, a BC Jesuit and admirer of the statue prevailed upon an unknown donor to purchase it for the new campus. The statue, which had crossed the ocean without trouble, came apart in the journey up Commonwealth Avenue. Michael's wings, sword, and thunderbolts all broke and were replaced with plaster for several years until new marble pieces could be completed. Originally designed to house large lectures and convocations, Gassoon 100a.k.a. "T-100" and "The Irish Hall"hit the skids in the 1960s when a demand for office space caused the University to split the campus's best-known and best-decorated auditorium into a partition-riven set of open-roofed cubicles filled with members of BC's financial staff. Students came to Gasson 100 to deal with bills and delays in financial aid (BC was having cash flow difficulties at the time). Employees lined up at cashier's windows to pick up their paychecks. And accountants, purchasing agents, auditors, and secretaries worked at typewriters and mechanical calculators beneath strands of fluorescent lights that hung from the high ceilings and by the glow of the large stained glass depiction of St. Patrick trying to capture the attention of King Laoghaire at Tara. Thomas O'Connor, currently BC's historian, was a member of the faculty during those hard times and will not soon forget entering a financial affairs office through a portal inscribed Quis Ut DeusWho is as God? Br. 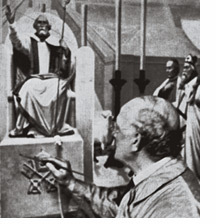 Francis Schroen (pictured at work), the tormented and self-taught Jesuit artist who left his handiwork on nearly every important public surface in Gasson Hall, was born in 1857 in Germany and brought to the United States as an infant. Raised in Maryland, Schroen worked as a housepainter and wall decorator. After he lost his young wife to disease, he abandoned their daughter and turned to Ouija boards and automatic writing as a way to communicate with the beyond. Believing that Satan was sending him messages and was trying to throw him off his scaffold, Schroen one day sought refuge in a church. In a sense, he never emerged, and in later years referred to himself as "a brand snatched from the burning." At age 41, he was accepted as a Jesuit lay-brother, and he soon made a reputation for the interior decoration of buildings at Georgetown and Fordham. When he arrived at BC in 1913 at Fr. Gasson's invitation to "garnish" the just-dry plaster of Gasson Hall, Schroen was greeted as a celebrity whose "warm artistry," noted the student magazine The Stylus, would show to good effect "under the softened light shed through the stained glass windows" that were planned for Gasson 100. Schroen's work over the next years included the murals in the Gasson rotunda, in the Fulton Debating Room (Gasson 305), and in a large conference room now used by the Arts & Sciences dean. But his most ambitious work was The Church, the Educator of Mankind (accompanying photo), which looms over the stage of Gasson 100. 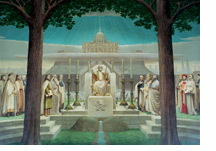 At 27 by 12 feet, the painting depicts the apostle Peter on a throne flanked on each side by robed triads of eminences who exemplify "the 16 profane and sacred arts." Among the exemplars are Moses (the only non-Catholic on the wall), who is joined by "King Edward" and "Lord Russell" under the category of Law; Columbus, who is categorized with Marquette and Cabot under Exploration; and Daniel O'Connell and John Carroll, who are listed as practitioners of Patriotism along with Sobieski (Jan, the 17th-century Polish king, and not Leelee, the contemporary starlet). In the left background of the painting, the silhouette of BC's Gasson Hall is on the horizon in the company of the cathedrals of Rheims, Canterbury, and Notre Dame. And that doesn't begin to exhaust the detail of waterways, sheep, lambs, candlesticks, trees, heavenly lights, seals, and temples that make the work a thickif somberstew of allegory. Schroen went on to do work in New Orleans, Chicago, and Kingston, Jamaica. He died in 1925 at Georgetown. No muralist touched a Boston College wall again until the 1990s. 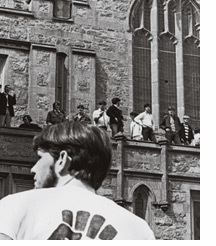 While it's commonly believed that BC students occupied Gasson Hall in protest of the war in Vietnam, in fact, the occupation ("by a small but peaceful group of dissidents," according to the Heights) that began on April 13, 1970, was driven by mundane concerns. On April 8, President Seavey Joyce, SJ, had announced that BC was facing an operating deficit and would need to raise tuition by $500from $1,500 to $2,000. Tuition had been raised by a precipitous $400 the previous year, and the students, many of them commuters who paid their tuition from work earnings, were outraged. The undergraduate student government declared a student strike, and a general boycott of classes ensued. Students picketed and occupied campus buildings off and on for 23 days, and the boycott of classes ended on May 5 (the University agreed to a compromise $240 increase), just in time for BC students and faculty to join the national boycott of classes over the bombings in Cambodia and the killings of students at Kent State University. Cara Cannella '01 is a freelance writer based in Boston. She has contributed to Inc magazine and the Boston Globe, and sat through many classes in Gasson Hall. Click any of the above images to enlarge them in a new window. Additional photography courtesy John J. Burns Library Archive ("Best-Laid Plans," "Seed Money," "Chopped Shop," "Occupation Force") and Georgetown University Library (inset, "Possessed").